Most drawing and design apps have an eyedropper tool that makes it easy to select a color that’s already on your screen. iPad drawing app Procreate has a similar tool, but it’s not that obvious at first glance. If you want to pull a color from a photo you’re using as a reference or want to reuse a color that you’ve already used in your image, it’s actually very easy to pick out that color. To select the color on the screen, tap and hold with your finger on the section of the picture with the color until it shows up in the color selection tool in the top right corner of the screen. 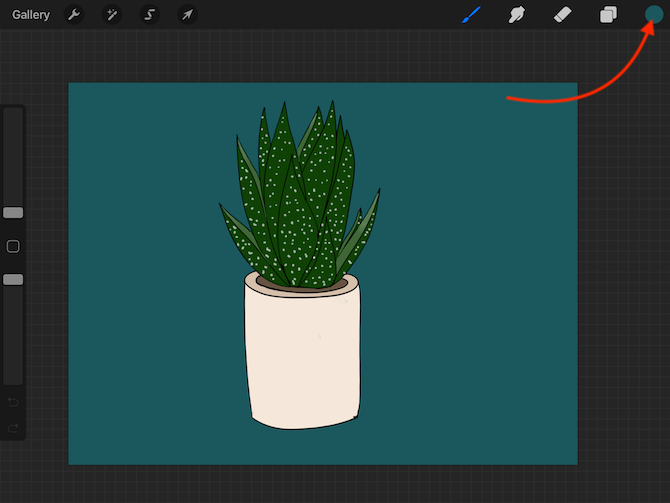 If you want to use that color to fill in a shape or drawing in your image, Procreate also has the equivalent of a paint bucket tool but it’s also somewhat hidden. To fill in your shape or drawing, tap and hold your Apple Pencil, stylus, or finger to the same color tool in the top right corner and drag it to the shape you want to fill and then let go. If you’re filling a particularly small shape, it helps to zoom in or to use the Apple Pencil for more precision. Also note that when using Procreate’s “paint bucket tool,” make sure that you’re using it to fill in closed shapes. If your lines aren’t completely joined, you will find that the color fills the entire canvas. While Procreate really shines on the iPad Pro, now that you can use the Apple Pencil with the sixth generation 2018 iPad, it makes the use of the app far more accessible and affordable to people who don’t want to shell out over $600 for a tablet.